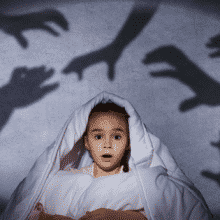 Does your little one experience fears at bedtime or wake with nightmares? Try these approaches to resolve those night-time scares. Before we get into techniques to resolution approaches, let us delve into an understanding of why these approaches work and why I suggest them. Fear, anxiety, and depression are fueled by one part of the brain: The limbic portion of the brain.1 The limbic system exists for one main reason – to keep us alive. In addition to giving us a great fight, flight, or freeze response, our limbic brain is also very unreasonable and finds anything (even seemingly small things) to be threatening. Fear keeps us alert and aware of our surroundings and circumstances – even in our subconscious and during sleep – which is why fear is not conducive to sleep or restful sleep. When our little ones feel fearful, we should be asking two things: Is our child sensing something intuitively that I should be paying attention to? If nothing seems to be off, how can we help our child move out of the limbic brain (fight or flight mode) into his reasoning brain? To help your little one move from the limbic brain into the reasoning brain, you need to understand in what instance the brain moves into limbic mode (fight or flight mode). When does our limbic brain take over? 2. When we are faced with an assumed threat. I always encourage parents to check and double check with the child's health professional that there are no underlying health conditions that would cause the child to feel internally unbalanced. Ironically, one stressor that is rarely spoken of which greatly influences levels of anxiety at bedtime is lack of sleep. Typically when I speak with a parent who has a child that struggles with nightmares or fear quite regularly, the child is often sleep deprived. Usually, the parent is not aware that the child is sleep deprived and/or doesn't know how to reverse the state of sleep deprivation that the child is in. Sleep deprivation is the absence of sleep during optimal sleep times. The thing about sleep is that it is not truly restorative unless sleep is happening during a person's optimal sleep times. Optimal sleep times is unique for each individual. If your child is not sleeping during his/her optimal sleep times, his/her body will not remain in homeostasis and will be stressed. Ensuring your child is not stressed will allow the limbic brain to yield control of the body to the prefrontal cortex (the rational brain). This is why ruling out stressors is the first step to resolving a fearful state – and reaching restful nights in general. Without ruling out underlying causes as to why the limbic brain is in control, the child will be less able to switch over to her reasoning brain and use the tools in this next section. 2. Give power back to your child. Just like any challenge in life, experiencing fears can be an opportunity for growth. Help your child learn how to move into the “upstairs brain” (otherwise known as the pre-frontal cortex) by creating a calming ritual. Calming effects are different for each person, so customize this ritual for your child. 1. Breathe – mindful breathing can be one of the most powerful ways in which we can calm our bodies and transition from the limbic mode. 2. Replace the scary thoughts – Does your child have a favorite book or character? Have her replace the scary thoughts with pleasant ones. Have her envision herself in her favorite book or storyline. 3. Take control – some children find it comforting to have a “monster spray” or some sort of monster repellant right next to them. Believing that they can take control over the situation can help a little one push away those fears. 4. Two is better than one – When it comes to feeling afraid, feeling alone is one of the most challenging states in which to self-regulate. We are social beings, and co-regulation is one of the most effective ways children learn to self-regulate. Although children's' fears may seem irrational to us, it is so very real to them. And knowing a caring adult is there when they feel afraid can be one of the most comforting experiences. Children learn how to become calm by how they are calmed. 5. Last but not least, avoid exposing your child to something that may induce nighttime fears. As I mentioned before, the limbic system is very irrational, so watching a scary movie or something that the child perceives as scary, the child's limbic system will react to the movie or the situation as real and will induce the same response as it would as if it was really happening in the child's world. Avoiding exposure to fear-inducing situations can be one of the most helpful things a parent can do to avoid nighttime fears. And finally, don't lead the witness – Your child cries out for you and the first thing out of your mouth is: “did you have a bad dream, honey?” The child will pause and think “why yes, as a matter a fact, I did!” Whether she did or not, let her tell you why she feels like she needs help. Otherwise, you may be in for “I had a bad dream” story perpetually. Keep the end goal in mind – For most of us parents, we want to raise confident, independent, loving, successful, empathetic humans. As easy as it is to lose sight of long terms goals in the middle of the night, remember that the ultimate goal is to raise a child that can self-regulate. So go to them, yes, over and over…but remember to give them the tools and help them put into practice the tools that will help them navigate their fears as well.